Rob Hanes Adventures #20 brings Rob face to face with President Chester Humbert, who has privatized Justice International as his own personal police force and intelligence agency, concluding a story arc begun in issue 19. Look out for “Citizen Humbert" in summer 2019! Following its exciting debut at the 2018 San Diego Comic-Con, Rob Hanes Adventures #19 is now available for purchase from WCG Comics! 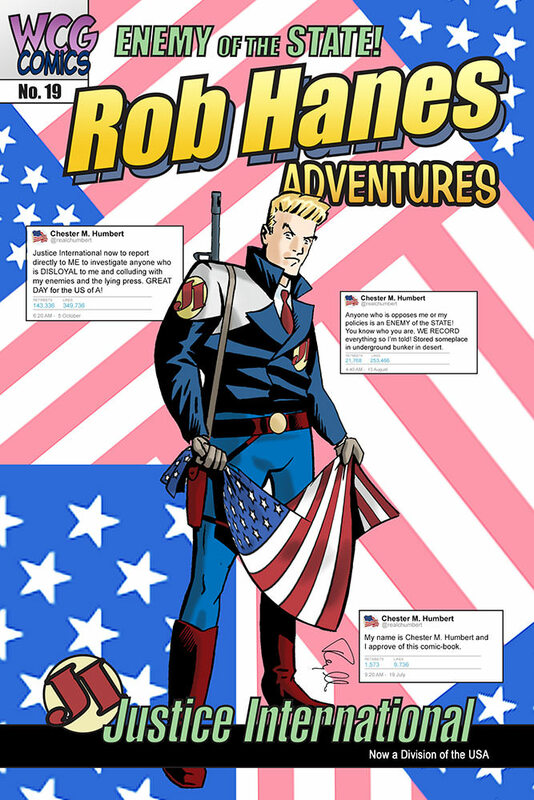 Inspired by our new era of fake news, in Rob Hanes Adventures #19, after Justice International is nationalized by the Federal government as the new investigative arm of the White House, Rob finds himself in the middle of political intrigue as terrorists attempt to detonate a dirty bomb in Europe. Click here for the press release and details. ALL BACK ISSUES STILL AVAILABLE! 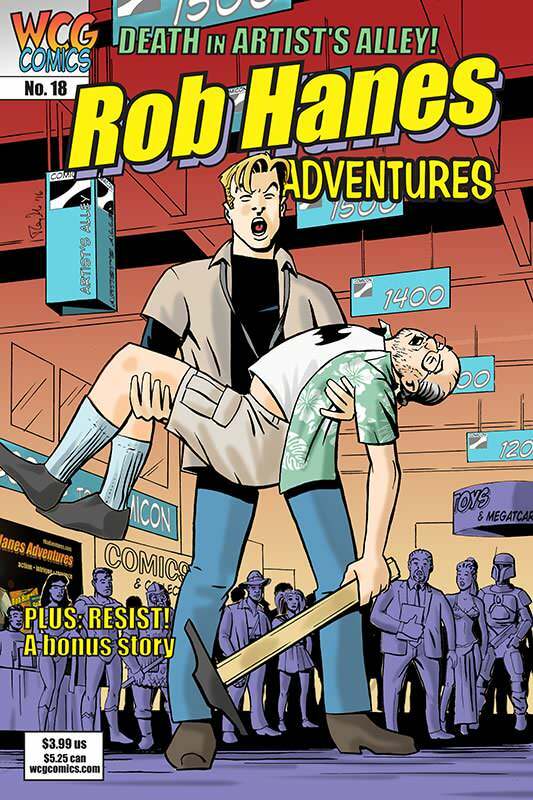 Following its debut at the San Diego Comic-Con, Rob Hanes Adventures #18, featuring "Death at Comicon" and a bonus back up story, is now available. Use the order link below or go to the webstore for this and all other back issues. High adventure is alive and well in the 21st century! Rob Hanes Adventures is an all-ages comic-book series about a globetrotting private eye and troubleshooter that has been described as "Tintin meets Indiana Jones!" Under the auspices of worldwide Justice International, Rob Hanes travels the world on assignment, facing adventure, intrigue and romance at every turn! Every issue is complete and self-contained, so jump in at any time! Tackling the Era of Fake News in Rob Hanes Adventures! (July 2, 2018), First Comics News. 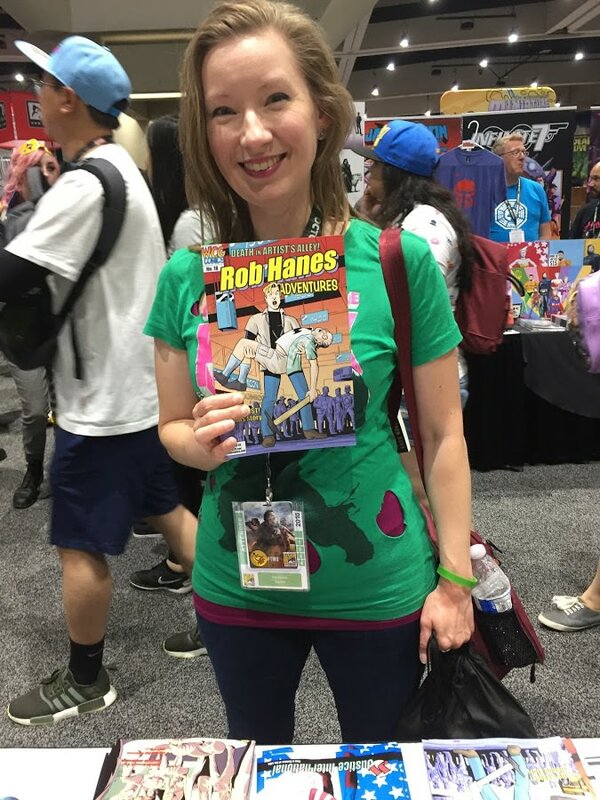 Rob Hanes Adventures Reflects the Current Political Administration for San Diego Comic-Con (July 2, 2018), Bleeding Cool News. Comic-Con Announces 7th Wave of 2018 Special Guests!, San Diego Comic-Con Toucan Blog/News Release (April 16, 2018). RICH INTERVIEWS: Randy Reynaldo Creator/Writer/Artist for Rob Hanes Adventures by Richard Vasseur (July 11, 2017), First Comics News. RICH REVIEWS: Rob Hanes Adventures #18 by Richard Vasseur (June 16, 2017), First Comics News. Rob Hanes Adventures creator Randy Reynaldo featured in wired.com as part of the magazine's 2013 San Diego Comic-Con coverage! 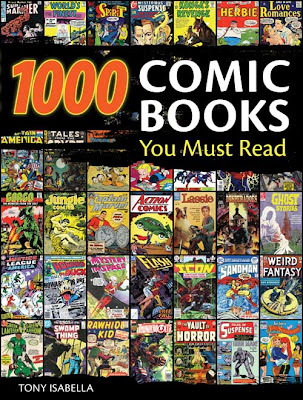 Issue 10 was featured in 1000 Comic Books You Must Read (2009) by Tony Isabella! Read an interview with series creator Randy Reynaldo at the Newsarama website. Order the entire series using the order link below (view options in the drop down menu). Every issue is self-contained! Or visit our webstore to order specific back issues! 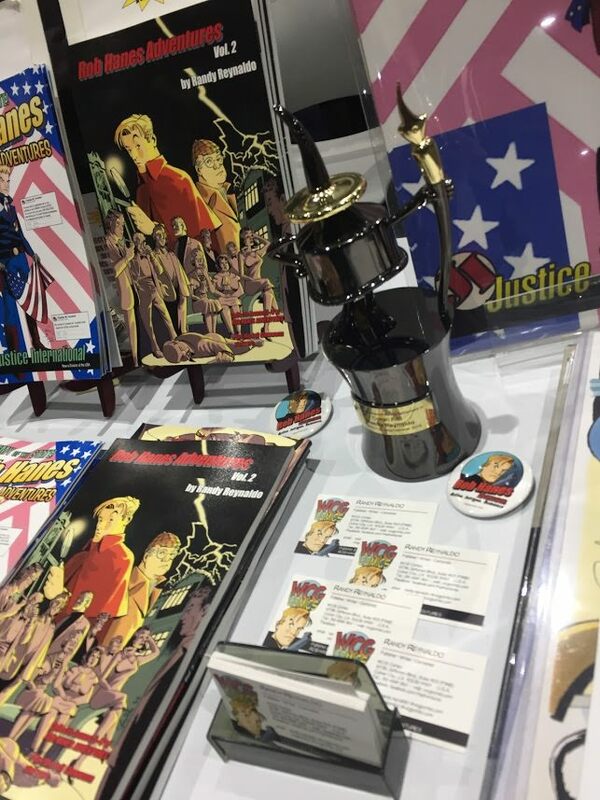 WCG's report of the 2018 San Diego Comic-Con is now available—Rob Hanes Adventures writer-artist Randy Reynaldo was a featured Special Guest at the show and was surprised with an Inkpot Award for Contributions to Comic Art! Read here for details. Now available in digital format at ComiXology! In 2014, we marked 20 years of publishing! Read the full story here. Visit the WCG Comics YouTube Channel! To send an email, go to our contact page. All content and artwork at this website © Randy Reynaldo. All rights reserved.